Angelo Ruiz is dealing with a lot. The 17-year-old sounds happy, but when I ask him to tell me about how he grew up, he reveals a story that would make anyone marvel at his ability to simply survive. Ruiz then talks about the many times he and his sister went to a nearby church to eat because they didn’t have any food, how his mother turned to drugs and sank into a deep depression after being diagnosed with Lyme disease and multiple sclerosis, and the toll that poverty has taken on his family. Is there such a thing as a safe space when you grow up that way? Only these days, lacrosse isn’t such a safe space for Ruiz. 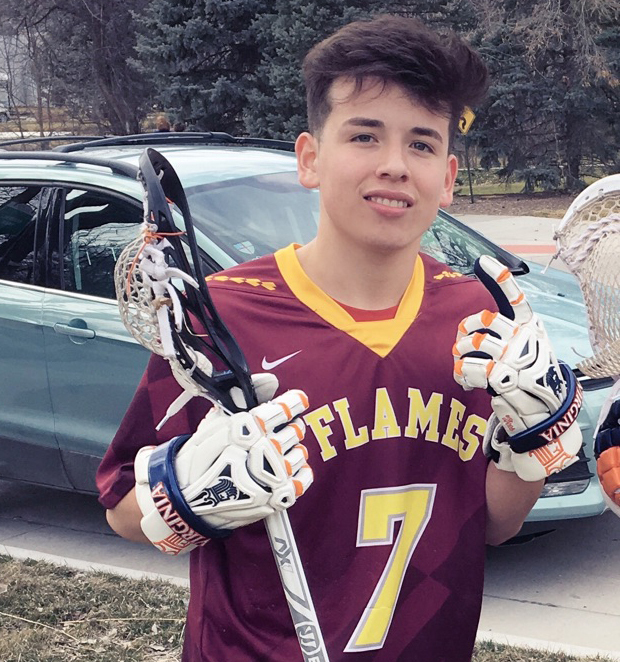 A month ago, Ruiz’s youth lacrosse team, 7 Flames, was one of three primarily Native American teams informed it had been expelled from the Dakota Premier Lacrosse League, the only lacrosse league in the Dakotas for players ages 11 through high school, for reasons that remain murky but have possibly exposed an ugly undercurrent of racism that Native American players like Ruiz have had to consistently stomach while participating in the league. The official story from the league is that the three teams were expelled because they violated league rules. But it turns out there was a lot more to the story. According to the three expelled teams, they were banned from the league this season after complaining about being racially taunted by fans, other players, and even coaches and officials. And it wasn’t just one incident. It was incidents. Cody Hall, the director of 7 Flames, said last season his players were routinely called “prairie n—–s,” a common slur used to demean Native Americans, and often were the victims of what he considered to be unsportsmanlike physical play, which he claimed usually was ignored by officials. “It was just damaging,” Hall said. Hall said his players regularly were slashed with lacrosse sticks and on multiple occasions had their shins scraped by their opponents. It’s common for Native youths to wear long hair, and during games those players have had their hair violently pulled. Having experienced these incidents often since he began playing lacrosse in eighth grade, Ruiz has largely conditioned himself to ignore the racial slurs and excessive physicality. But last season, he said he nearly lost his composure after a particularly violent attack on his cousin during a game. His cousin, who used to wear a long braid before he cut it last summer, had his hair pulled so hard by an opponent that it dislodged his helmet. Deadspin recently released excerpts from a recorded phone conversation between Mitchell and Ali Vincent, a volunteer with the 7 Flames, that seemed to indicate race was at least a factor in the decision to dismiss the majority-Native teams from the league. Making matters worse is that Hall and the other teams weren’t informed they were no longer in the league until last month, right before it was time to register for the upcoming season. That meant not only were they unable to play lacrosse, but it was too late to do anything about it. Now, in fairness, Hall admits they didn’t follow the rules perfectly. They were informed there were certification issues with their assistant coaches, even though that’s an issue for a lot of teams in the league. And when the JV team was short a player, a 21-year-old semi-assistant coach was used to fill the void. They were never given a heads-up that any of these minor violations would jeopardize their standing in the league. History and sports are fraught with examples of the unfair consequences people sometimes face when they decide enough is enough. Hall certainly is no stranger to speaking out against racial and social injustice, or the unforeseen consequences that come as a result. He was considered one of the key figures in the historic protests against the Dakota Access oil pipeline, a controversial $3.8 billion project that generated outrage among thousands of Native Americans who believed the construction of the 1,200-mile pipeline crossed over sacred land and made them vulnerable to contaminated water and other potential disasters. Hall was arrested for trespassing on Dakota Access pipeline construction sites, where many of the rallies were held in an effort to thwart construction. This, however, is a much different fight. Many of Hall’s players come from poverty – and lacrosse likely is their only refuge from serious problems that have plagued the country’s first and perhaps most vulnerable citizens. Ruiz lived with his grandmother on the Rosebud Indian Reservation, which, like other reservations, has been ravaged by drugs and poverty. At Rosebud, the unemployment rate is estimated to be between 65 and 80 percent. So when Ruiz said lacrosse was his way out, it almost was an understatement. He has received some invitations to play in lacrosse camps for potential college prospects this summer. But Ruiz, who is currently living with one of his teachers and her family, has to figure out how he’ll pay for it. He fears not playing in the league this season will jeopardize his future, and he also worries that speaking out about what he’s experienced will deter college coaches from recruiting him. 7 Flames and Susbeca, another team that was expelled, are playing exhibition games right now as they contemplate what to do next. And the Lightning Stick Society, also dismissed from the league, likely will join a league in Minnesota despite the many hours the team will spend on the road. For now, it appears as if playing lacrosse in a regulated league in South Dakota won’t be an option for any of them anytime soon. I ask Ruiz if this experience has changed how he views people, or made him bitter. Taking the high road is admirable in theory, but many people have been left stranded on that road.